The first ferry across the river was established in 1829. where the Lake street bridge now is. In 1833 a floating bridge of logs was In operation just north of the present Randolph street bridge, A foot bridge over the north branch was built in 1832 at Kinzie street. The first drawbridge over the main branch of the river was placed at Dearborn street in 1834. In 1854 a pivot bridge was built at Clark street. These and other bridges of that time were built by the persons most directly benefited by them. It was not until 1857 that a bridge was built entirely at the city’s expense. This was the structure over the south branch at Madison street. It cost $30,000. Until 1872 the swing bridges were turned by hand, but in the year named steam power was installed on the Dearborn street structure and later most of the other bridges in the downtown section were similarly equipped. In 1895 the Rush. Lake and Van Buren street ‘bridges were operated by electric motors. 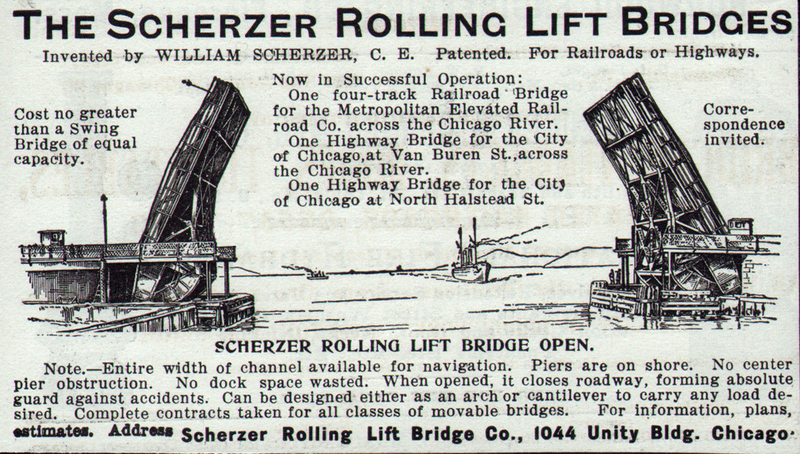 The last named structure, which was opened for traffic in that year, was the first of the Scherzer rolling type. The Halsted street lift bridge, the first and only one of its kind, was opened in 1894 and was operated by steam. It cost the city $242,880. 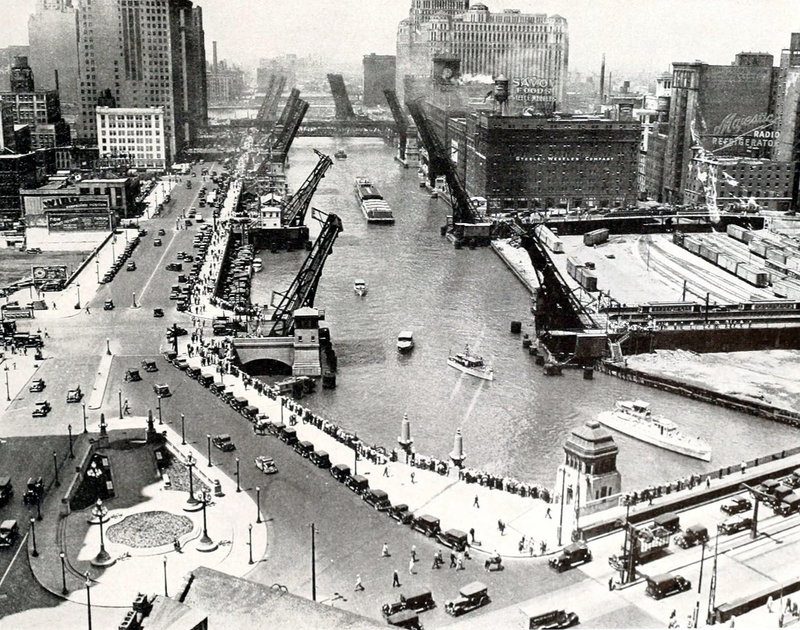 In 1922 Chicago had forty-seven bridges with movable spans and thirty with fixed spans. There were also thirty-nine viaducts and eight foot bridges. Most of the movable bridges are operated by electricity.